Achieve a new level of productivity and throughput at the checkout stand — with the Symbol DS9808. The groundbreaking DS9808 is designed inside and outside to bring a new level of versatility, functionality and performance to the checkout stand. Outside, the DS9808 offers an extraordinary one-ofa- kind hybrid form factor by marrying a solid base with our advanced handheld ergonomics, creating a scanner that is truly designed to deliver superior comfort and ease of use in both handheld and handsfree scanning modes. The integrated base requires very little real estate at the point of sale — ideal for space constrained checkout stands. Inside, the DS9808 offers the very latest in scanning technology, delivering record swipe speeds for 1D and 2D bar codes, as well as the ability to capture images and signatures. When it comes to scanning distance, the DS9808 sets a new level of flexibility. The handheld decode range on the standard range (SR) model can scan up to 10.5 inches/26.7 cm away; the long range (LR) model can scan up to 18 inches/45.7 cm away — ideal for retail stores with a mix of merchandise that includes bulky or heavy items that should remain in the cart. Additionally the hands-free decode range in both models can be adjusted to meet your needs — for example, to match the EAS deactivation range or prevent inadvertent scanning of items in space constricted cash-wraps. The Symbol DS9808 has what it takes to keep the checkout lines moving, enhancing customer satisfaction and sales. A swipe speed programmable up to 100 inches/254 cm per second provides rapid fire scanning — a must in busy environments. With omni-directional scanning, there is no need to take the time to orient bar code and scanner. The ability to capture virtually any 1D or 2D bar code quickly and easily eliminates the need for checkers to manually enter a UPC code. 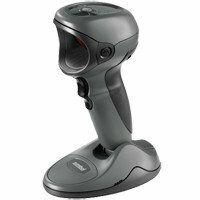 The ergonomically positioned trigger enables easy and comfortable scanning in handheld mode. A specially designed laser-generated aiming pattern offers a clear and bright field of view even in bright sunlight, ensuring first time accurate aim. The extra loud beeper provides audible verification of an accurate scan in even the busiest retail environments. And a single swipe can simultaneously scan the price and deactivate an EAS tag, further protecting productivity at the checkout stand — and preventing erroneous alarms that embarrass customers and waste security staff time.